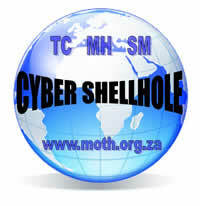 The MOTH Cyber Shellhole was formed in April 2010, specifically for qualifying members who are living abroad or in remote areas of South Africa, where there is no nearby Shellhole. 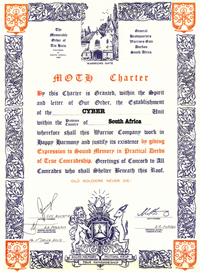 Qualification for membership is listed under Annexure B of the MOTH Constitution and General Standing Orders. Membership (Capitation) fees of R310 (ZAR 310) are payable annually in advance and are payable in July of each year. New members will be charged pro-rata for the first year of membership, based on the quarter in which they join. Membership Badge – The registered membership badge is a miniature bronze Tin Hat, embossed with the letters MOTH. MOTH Membership Card – This card is issued annually on receipt of annual membership fees. Now that the Shellhole is firmly established and well-known in our MOTHing circles, I am very pleased to report on its progress since inception in April 2010. There had been some frequently-asked questions having to be quite often answered as to the validity of the Shellhole but, slowly, its importance has eroded any doubts in the minds of those comrades. It has shown that the Memorable Order of Tin Hats is so much more than a South African-based veteran organisation with a footprint in other neighbouring countries and in England. It’s membership includes veterans from various branches of Service as well as from other countries. Cyber Shellhole members, being based at such diverse countries such as Bali, United Arab Emirates, Austria and (until recently) Guinea, help to promote the Order where it has never been heard of before. Our members are also currently based in England, Scotland, Portugal, Belgium, Canada, America, Australia, New Zealand, Namibia (plus a few in South Africa who live too far away from formal units) and our members “fly the Flag” and represent the MOTH at their local Veteran Gatherings, clubs and Associations on a regular basis. On top of this, Cyber members support the related charity drives, as world veterans. These Moths have also represented the Order at Remembrance Services in their respective areas and MOTH wreaths have been laid in so many centres all over the world. One member is a regular delegate at annual services at the Menin Gate and has presented a Floral Tribute, annually, on behalf of us all at this venerated site. Members are happy to transfer into a “formal” unit, should they move back to an area where such a Unit exists, as this is one of our core beliefs. We use the Shellhole as a “home away from home”. Cyber Shellhole will never be used as an alternative unit for those few “disgruntled” Moths with a gripe or a grudge. Perhaps a bit slow to initially get off the ground, our membership has grown four-fold in three years. That’s a good growth rate, indeed. Our average age is also under 60 years, which is a good indicator of the “health” of any Shellhole in the Order. Administration functions are quickly and efficiently overseen, complying with the MOTH GSO’s, and excess funds incoming are earmarked for direct transfer into the Warriors Gate Maintenance Fund. I am confident in assuring all Moths of Cyber Shellholes’ continued growth and impact – not only with the Order itself – but with the World Veteran Community as a whole. We are a Unique Organisation and the Shellhole is just as unique. It’s an exciting and ongoing project, one that is of benefit to us all and a privilege to be a part of it.